I thought I’d show you the rest of the holiday decorations I put out to get into the Valentine’s Day spirit. First, here’s an easy wax paper hurricaine craft. 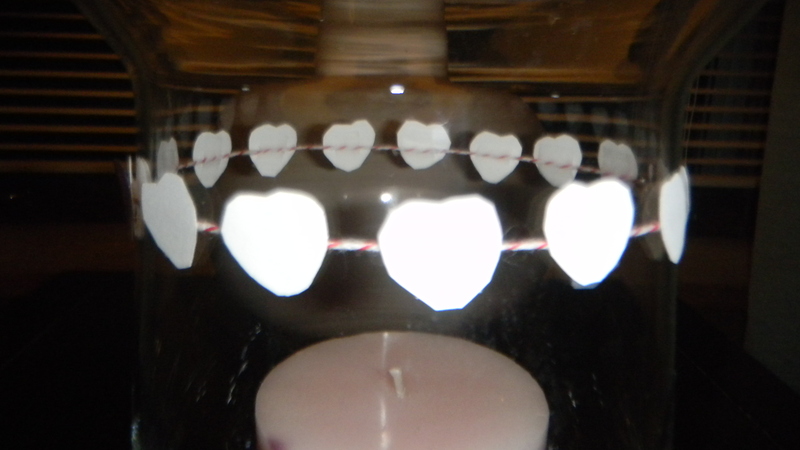 I already had the hurricaine, so I cut out a bunch of hearts from wax paper and taped them to a piece of red and white baker’s twine. 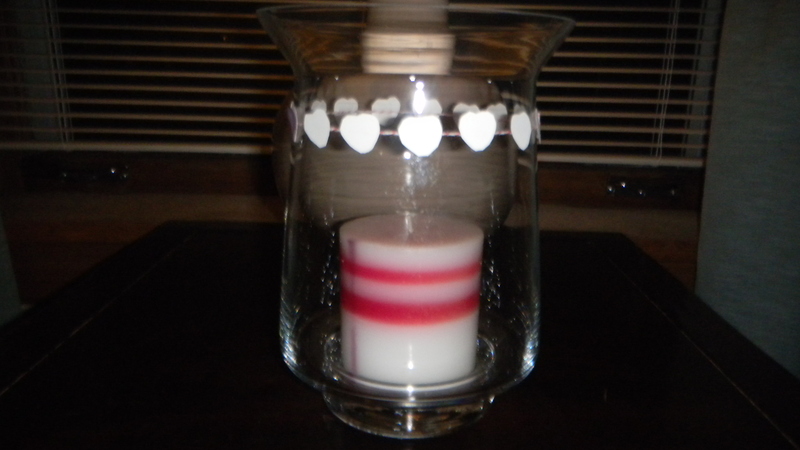 I thought the pink and white candle looked nice with it. 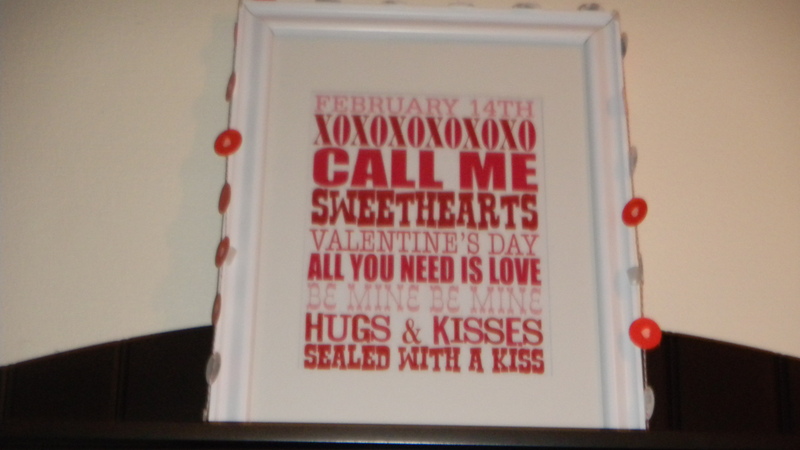 In the entryway, I switched out the subway art to a printable with a Valentine’s theme. 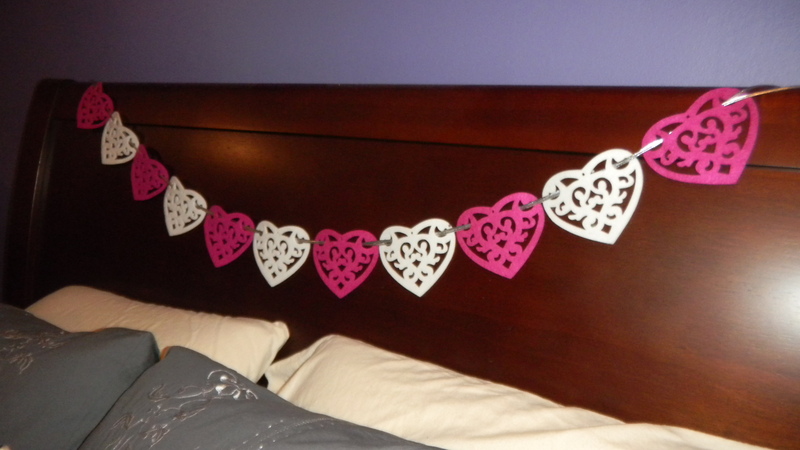 I created a teeny bit of garland by punching out holes from some paint chip samples i had laying around and gluing a punched out pink heart to the middle of the circle. 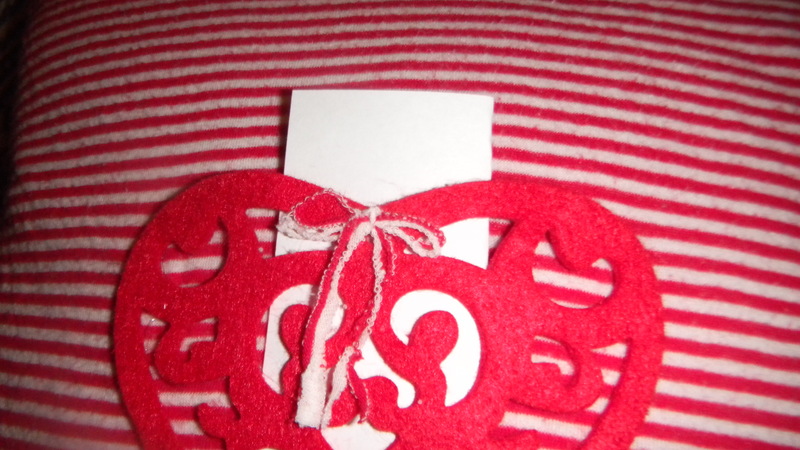 Again, I taped the circles to some red and white baker’s twine. 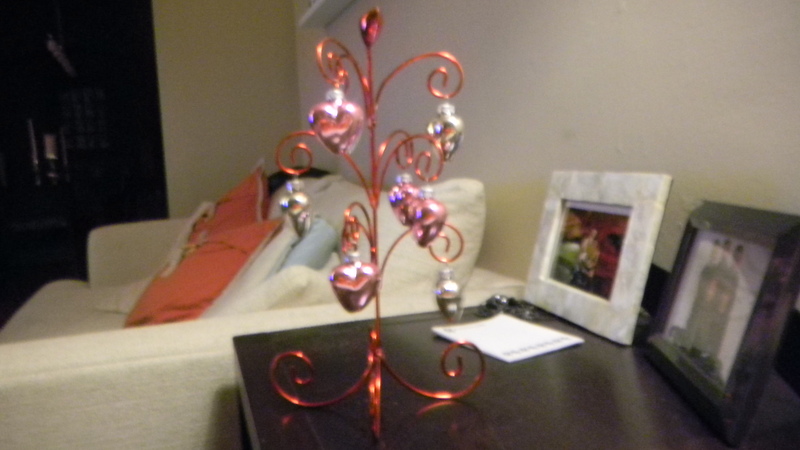 Finally, I put out this cute little heart tree. I got it as a gift and I just love how the hearts are like little ornaments. That’s all I had around my house. I don’t really get too crazy for Valentine’s Day. Just a few small decorative items to fill in after all the Christmas stuff comes down. Do you put anything special out for Heart’s Day? Is it too early to start thinking about Valentine’s Day? I think no. 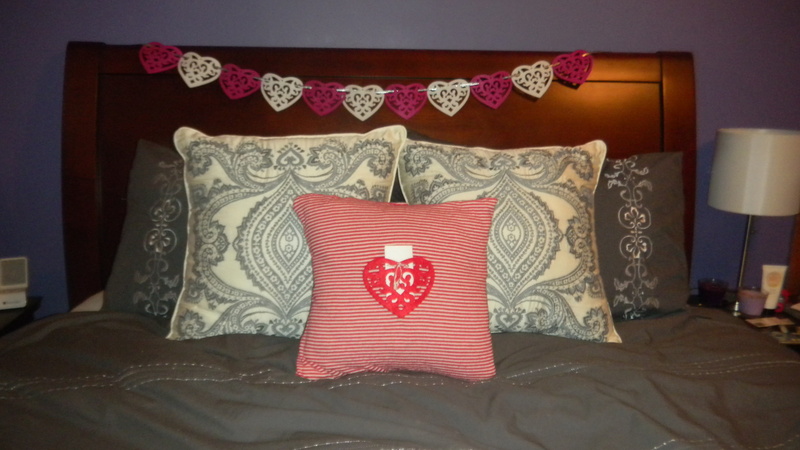 After Christmas was over, I needed some decoration in our house, so I went straight to the heart day decor. And yes, that means my Valentine’s stuff has been up since early January. Who doesn’t love all that red and pink? I’ll start with the easiest (and cheapest) project I think I’ve ever done. 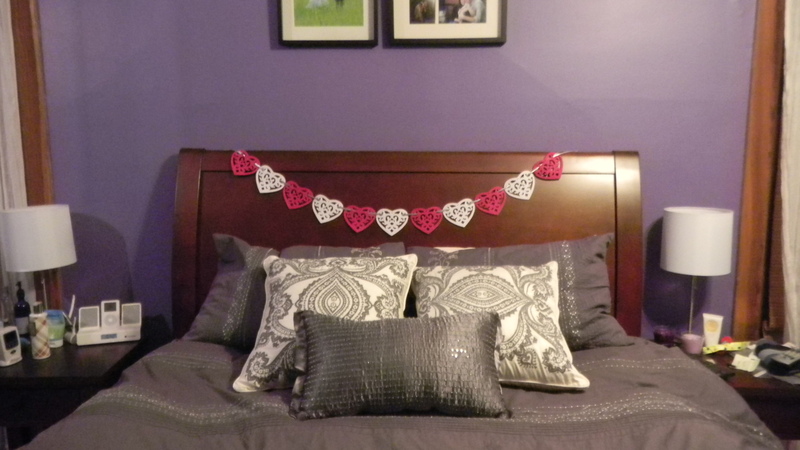 It’s the heart bunting that adds a whimsical feel to my bedroom. I really like the intricate design in each heart. Confession: I bought them that way. The hearts are made of felt, so cutting out that pattern would have taken a long time. Where did I get such cute hearts? Target, of course. But, you won’t find these darling little guys at the store if you go now. Nope, these guys were Christmas ornaments! Can you believe it? I guess it goes to show that with imagination, you can always find a new use for something. 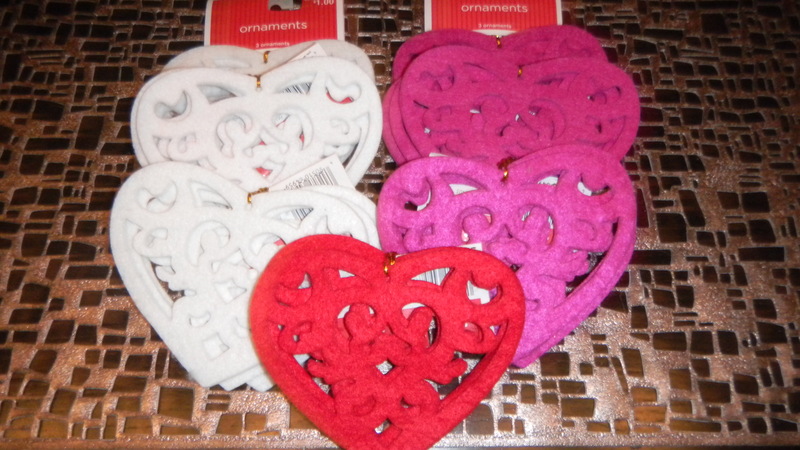 I bought these hearts at just $.10 per 3-pack, which were 90% off from their regular price after the holidays. I already had the silver string (used it to hold Christmas cards above our sidebar, actually), the total cost of this project was about $0.33 and took about 5 minutes of work. 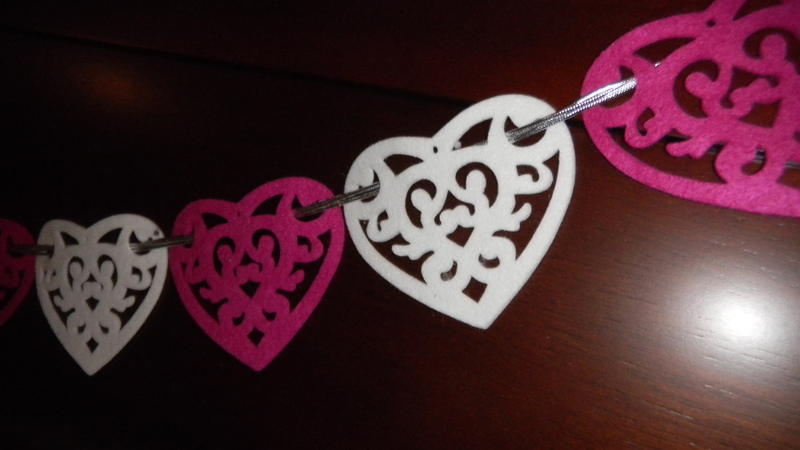 Keep a look out for more projects made with my super cheap felt hearts! 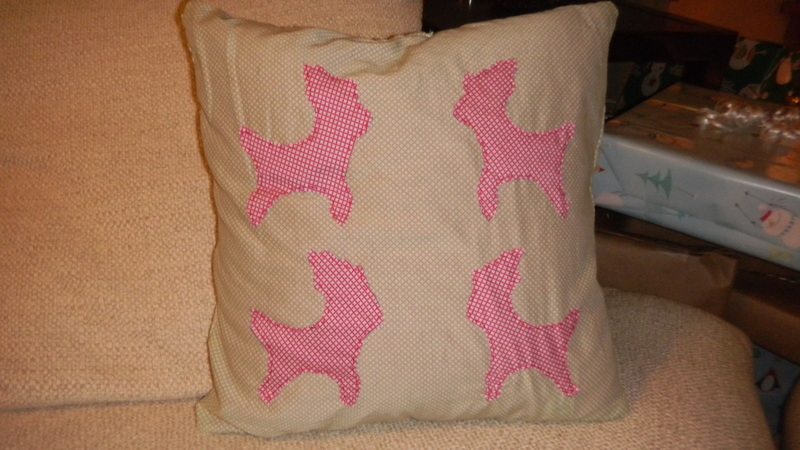 Continuing sharing my holiday crafts with you, I thought I’d next turn to the reindeer pillow I made. 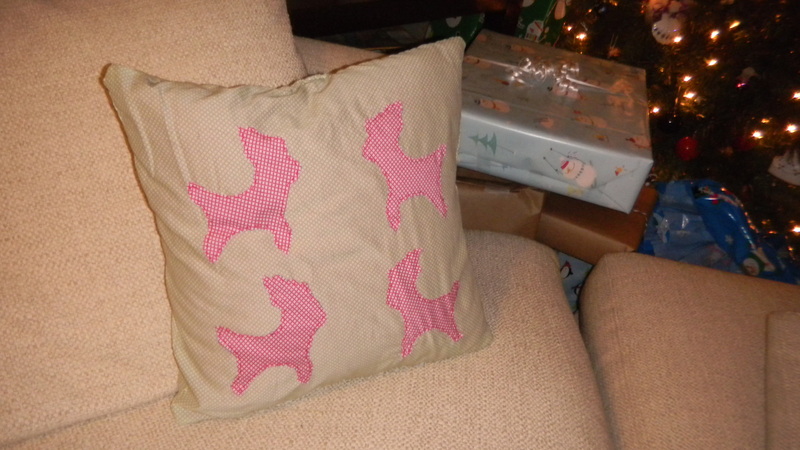 Every since I knew I’d never wear those green and red patterned dress shirts anymore, I knew the fabric would make an adorable Christmas pillow. 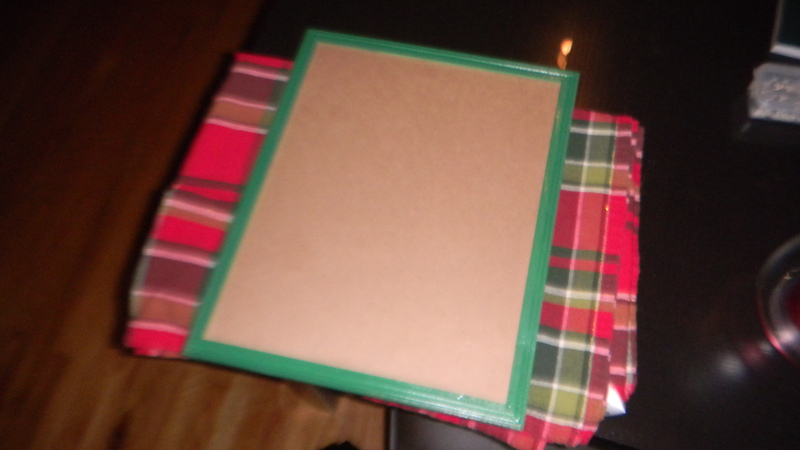 Originally, I was planning to use the green fabric to make a tree and sew it onto a plain red fabric square. But, I’ve recently been on a reindeer kick, so I figured cutting out reindeer instead of a tree wouldn’t be much more difficult. 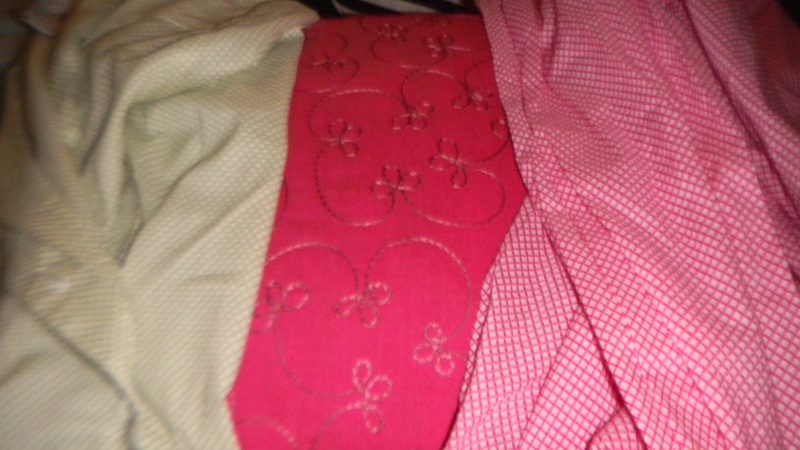 I started with two shirts, and an old pillow leftover from my all pink bedroom before I got married. Yep, that means this project was completely and 100% free. To start, I measured my pillow. 13″x13″. Add on an extra inch to allow for seams, and I knew I needed two 14″x14″ squares. Then I got to thinking. My shirt was a button down. 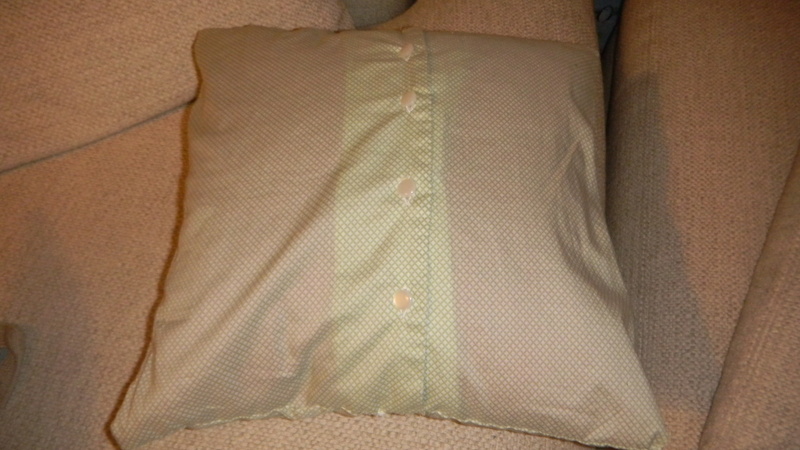 Why didn’t I just use the buttons to make a slipcover that can be easily removed? It worked like a charm. I just cut a 14″x14″ square into the shirt, and left all the buttons. 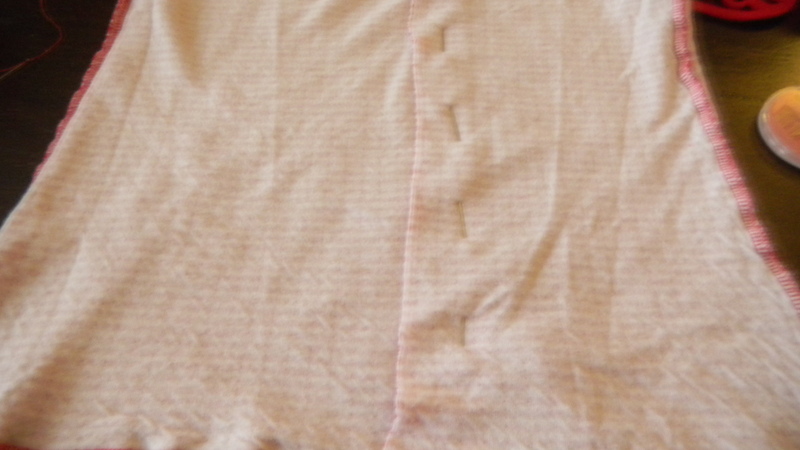 Way easier than trying to take off the buttons and sew two pieces of the fabric together to account for it (since I wouldn’t have gotten a 14″x14″ square from the front of the shirt). Once the squares were cut, I used my reindeer cookie cutter (from a set I had purchased after last Christmas for 50% off at Crate & Barrel) to trace the outline of the reindeer on the red fabric. I cut out four of them and sewed them onto the green fabric square (the piece without the buttons) that I already had cut. What to do from here was easy. I turned the fabric inside out and started sewing. By hand. 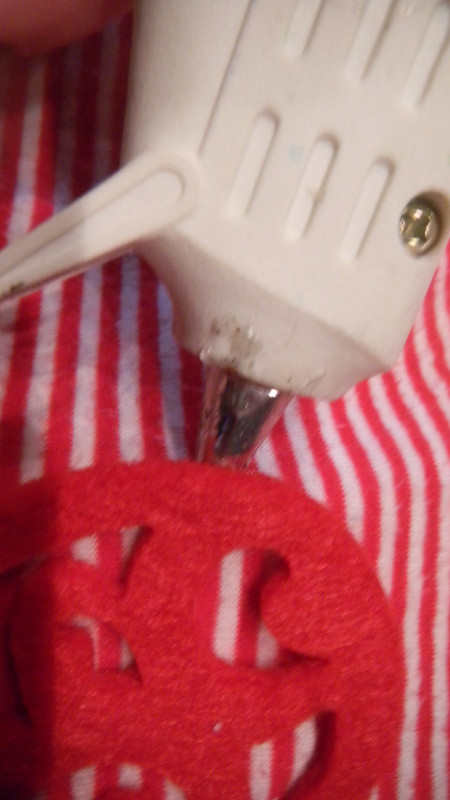 Yep, still no sewing machine. It didn’t take that long though. Then comes the part where I always hold my breath, I turn the fabric right side out and slide the pillow in to see if it fits. I have to say, the slip cover is so much better than having a regular pillow. 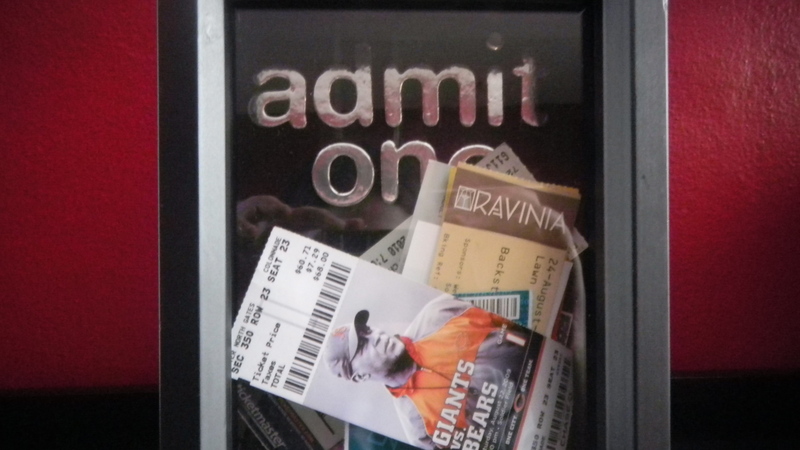 I can take the case on and off easily, which means I can swap it out for something else when the holidays are over. 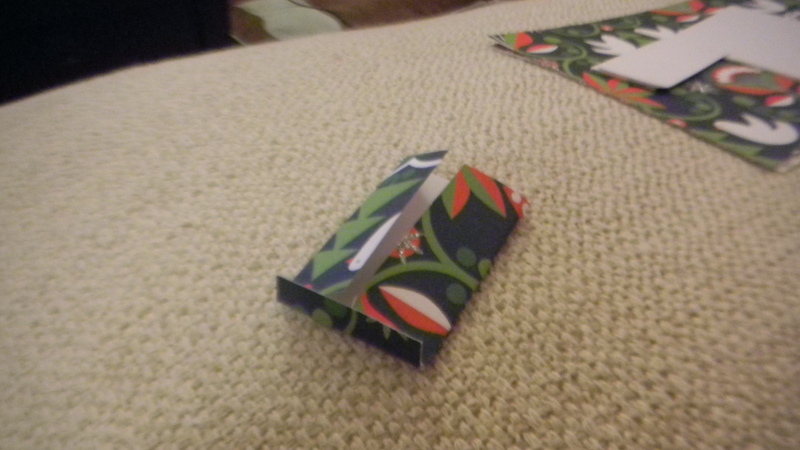 And, a folded up slipcover takes up way less space in my holiday decorations box than a pillow would. Christmas Countdown: 4 days to go! I’ve turned into a bad blogger. Here I am, trying new recipes, baking a ton of Christmas goodies, crafting out the whazoo, and I’m not sharing any of it. There’s been no time! Here’s the post where I try to get back on track. The house has been decked out in its holiday finest, from the tree, to the wreath I made, to all the presents wrapped and under the tree, I’ve been busy. 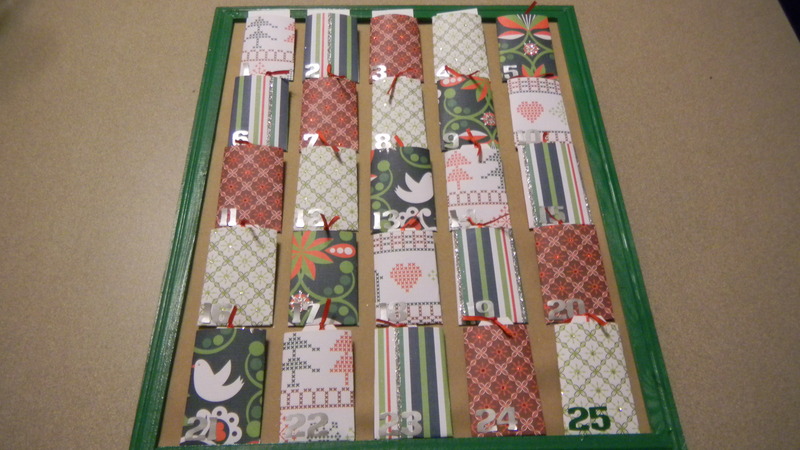 I thought I’d share the Christmas craft that started the season for me – the Advent calendar. Instead of a candy or treat each day, I made tags that list a different holiday activity for each day, to make it more personal. I put some old favorites in there, like bake Christmas cookies, decorate a gingerbread house, and watch “Elf,” but I also included new traditions I hoped to start, like sharing childhood memories of Christmases past, learning how to make my grandma’s Christmas cookies, and hitting you tube for some traditional Italian Christmas songs. I’ll admit, it was a struggle to get through all of the activities with our differing schedules. And of course, we sometimes had to double up on the holiday activity, but we did it. So, how did we male the calendar? The only things purchased for this project were from the dollar store and totaled $3. 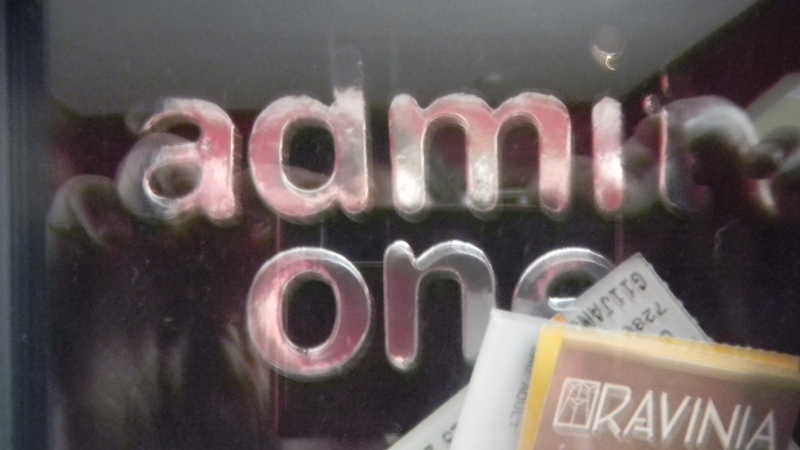 Those items were the plain wood frame and two sets of numerical stickers. I started by spray painting the frame, though you don’t have to. I used leftover green spray paint. 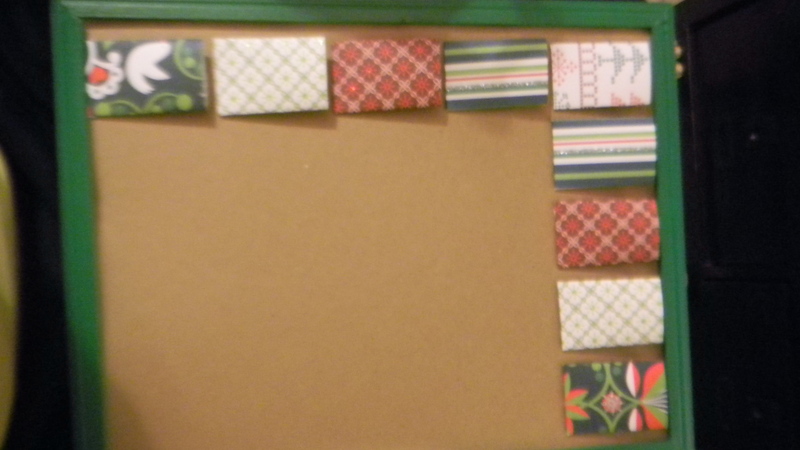 Next, I cut some packing paper for the background of the calendar. Then, I downloaded a template from flickr that was the shape of an envelope. 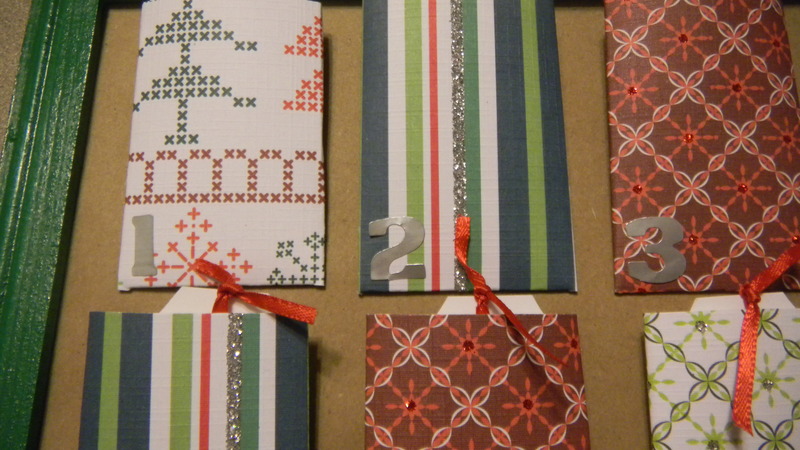 Take some festive scrapbook paper and use them for your envelopes. 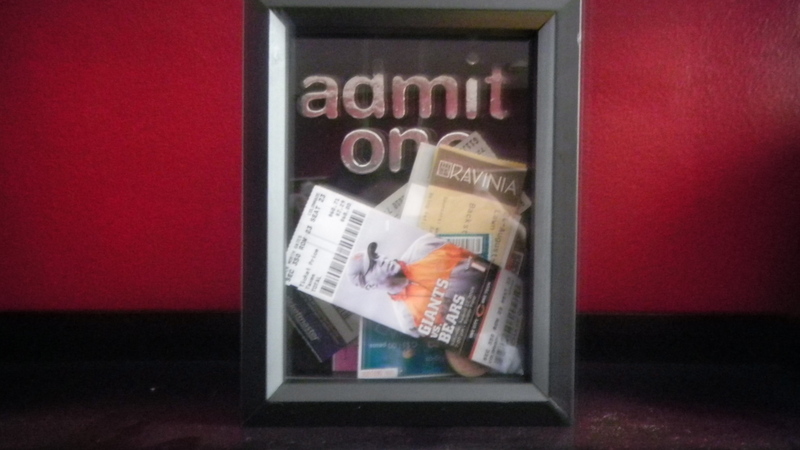 Once they’re made, arrange them in the frame to a pattern you like. I did five rows of five. Glue on the envelopes. I numbered the first 24 envelopes with silver numbers. I used green numbers for Christmas day. To finish off the project, I cut out 25 tags out of white card stock. To make this step easier, you can always buy them instead. 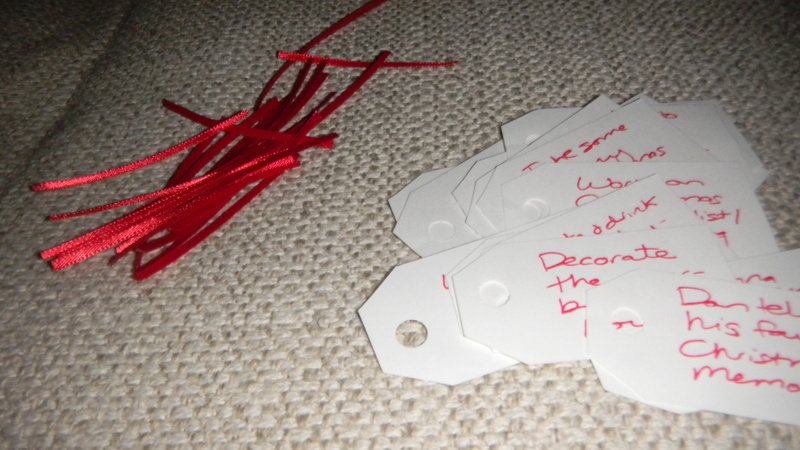 I wrote down one activity on each card in red pen, then punched a hole in each tag to tie on some red ribbon. Put the calendar in a prominent place in your home, and remember to do your Christmas activity each day. I’ve been gone for a few days being busy with work stuff, but now I’m back for this special Thanksgiving post. 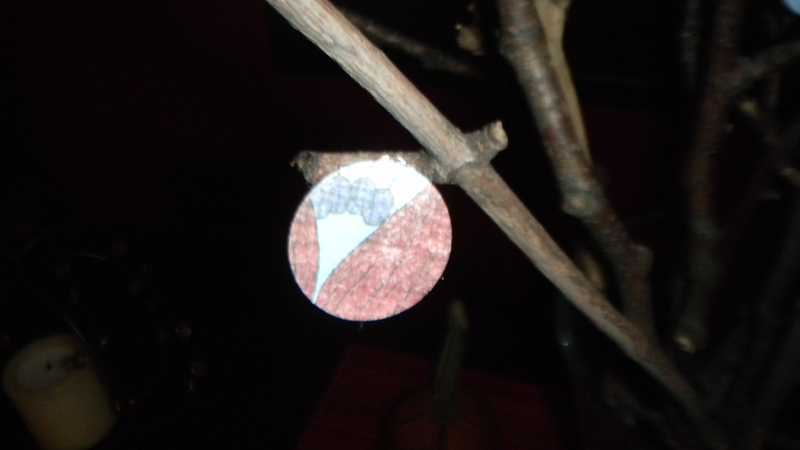 As I’ve become quite crafty as of late, I wanted to do a craft that really meant something this time of year. I decided to make a thankfulness tree. I started out by just picking up some sticks while we were out an a family walk with Phoebe. Surprisingly, gathering up these branches was not nearly as difficult as I thought it would be in the city. Next, I took a piece of fall colored scrapbook paper that I already had around the house, and used a hole punch to create circles. Every time a friend came over, I asked them to write down something they were thankful for on one of the circles. 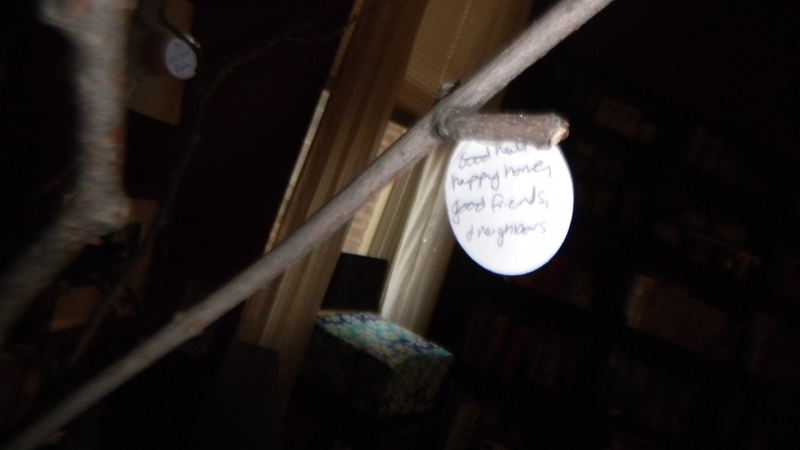 I even emailed family members I wouldn’t see in time to include the things they were thankful for on my tree. 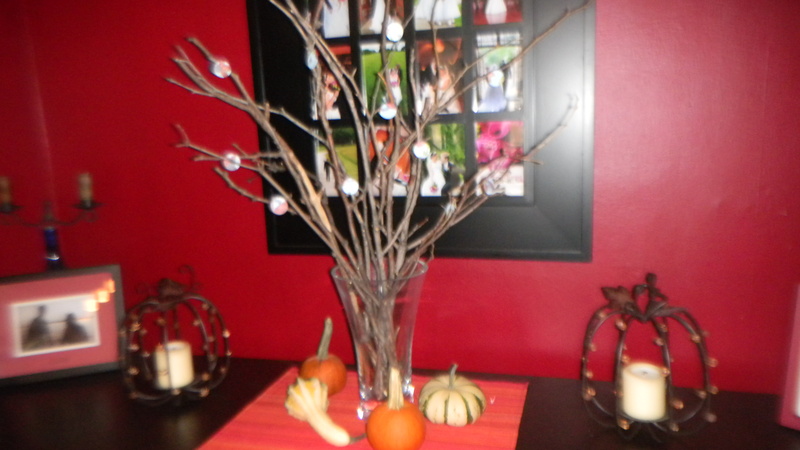 Once I had a few, I used a hot glue gun to stick the circles to the tree. I got started a bit late this year, so I’m hoping to get even more notes of thanks for next year’s tree. Still, it makes me smile every time I look at it.